I have the pleasure of speaking about traffic safety in Kentucky later this month, and I've been in contact with some of their engineers. I had heard about some retroreflective backplates in the state, so I received some information from the transportation officials. Notice the huge difference between the signal heads. The signal on the right, particularly for one with color-deficient vision, could be any number of lighted roadway items (or even something else). 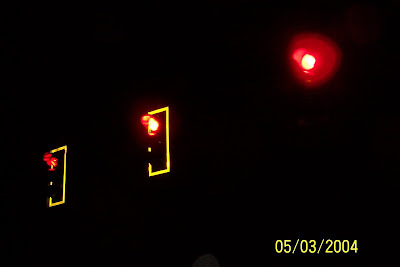 It is so much easier to distinguish the others as traffic signals, and to show you that the TOP (red) indication is lit. 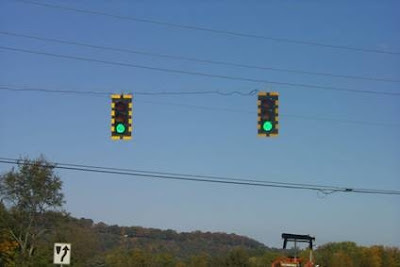 Here is another application where they did not fully outline the signals, but put strips around. Officials in Kentucky told me this application does not appear as effective at night (but I wanted to show it anyway).